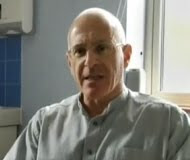 Ian Rubenstein is a doctor, a proper medical doctor working as a General Practitioner in Enfield, North London. He says he is agnostic but receives messages ... from the dead. "Linda is one patient whose husband Brian died suddenly following an operation last year. When she and her daughter Cheryl were with me one day, I had a strong sense of Brian's presence. He was a big man and had a big physical presence. I told them he was mentioning carpets - I had an image in my mind of a red carpet being rolled out. Linda and Cheryl could not believe it. They had just come from a carpet store and had been trying to choose new stair-carpet and couldn't decide between red and green. 'Dad wants us to choose the red one,' they both agreed." Often the messages are very ordinary, but they no doubt are meaningful to the people concerned. "On one occasion I kept thinking of the word Sutton. First I thought about Dr Sutton who I had worked with 25 years previously when I was a junior doctor. Then I read a book which I suddenly realised was by a man called Sutton and I kept seeing Sutton on maps. After that there was a request for a home visit for a patient named Sutton and I felt sure that I, rather than any of the other doctors, should visit her. The patient, an elderly woman, had a swollen knee. After I had dealt with it, I talked to her daughter and mentioned my curious Sutton coincidences. She told me she felt I was meant to visit her so she could tell me about her father who had died four years ago and on one recent evening had appeared before her and held her hand. I felt that I had strayed into a whole other realm." So does Dr Goldstein believe in life after death? After all he does appear to receive messages from beyond the grave. He answered, "I don't do belief but the evidence I have read, the stories I have heard and my own experiences make me lean towards it. You could say I am slightly more than half-convinced." Below is a video from a British television programme Talking To The Dead which features Dr Goldstein (about 2m.30s. into the video). Great story. Medical doctors give credibility to the field. This reminds me of when Brian Weiss's book on reincarnation came out. Here was a shrink talking about past lives. Sounds like a great TV show! I remember seeing the prog about this doctor. He appears genuine.